Nissan Juke has a "what were they thinking" look about it. Nothing wrong with that though. Somehow, the design team have managed to piece together a good bit of gear despite the 'canvas' that the stylists gave them. All jokes aside, Nissan have correctly identified that cars with their own 'character' can attract buyers. The uniquely styled Juke is just one more for the Nissan brand. Over the years, Nissan has had a few models where it seems the stylists have had a win over conventional wisdom. A prime example of such oddball styling from Nissan would be the S-Cargo from 1989. Marketed only in Japan, the S-Cargo has found its way to all corners of the globe as a 'grey' import. So Nissan's entrant in the ever growing small SUV-like lifestyle segment of the car market is this novelty shaped Juke. The little, front-wheel drive, trend setting, 5-seater 'cross-over' comes in three trim levels. Performance is non-turbo and turbo-charged, depending upon the trim level. Interestingly, the top-of-the-line version comes with all-wheel drive. Our drive car was the entry level model, the Juke ST. 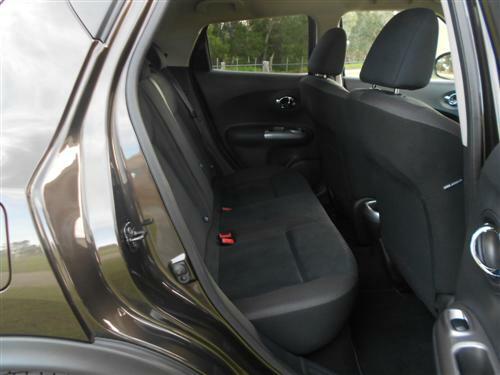 It came with the optional CVT-type automatic transmission, metallic paint and floor mats. The base model ST is very much the vanilla flavoured Juke. It is the only one of the three variants to come with a naturally aspirated engine. The other two versions, the ST-S and the Ti-S, both feature a turbocharged engine as standard. A nice feel was immediately evident with the Nissan Juke. The car demonstrated a solid feel with nothing but positive feedback for the driver. Driving dynamics for such a car were impressive. NVH qualities are well addressed, even in the base model. This makes for a good impression because there are times when an entry level car feels too basic. 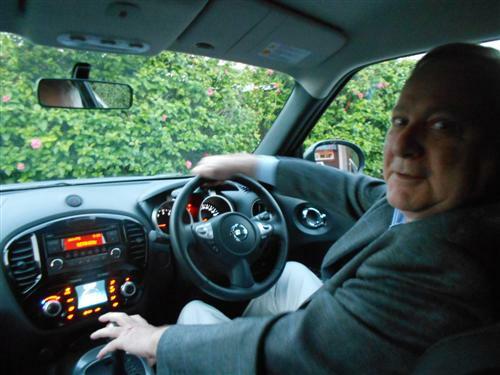 A slightly elevated driving position features with the Juke. It is more car-like than SUV-like in my opinion. The seating is comfortable and for an entry level car I thought the comfort level and the lay-out of the interior was quite pleasing, including the nice look and presentation of the seats. However, it must be said that the extravagant exterior styling is downplayed on the inside with the Juke ST. Everything about the interior is routine Nissan. Which equates to being quite OK in my book. 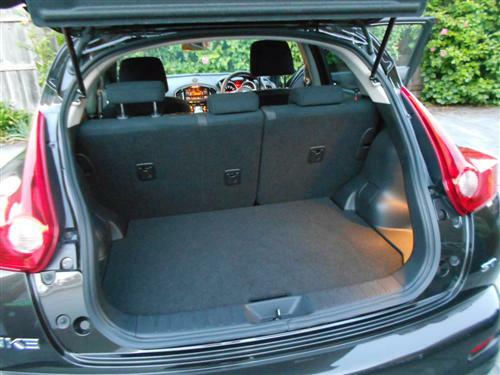 The standard 1.6 litre petrol engine is a good match for this base model car. No need to worry about performance, as even the base model Juke ST gets along quite well. Only performance enthusiasts need the turbo! 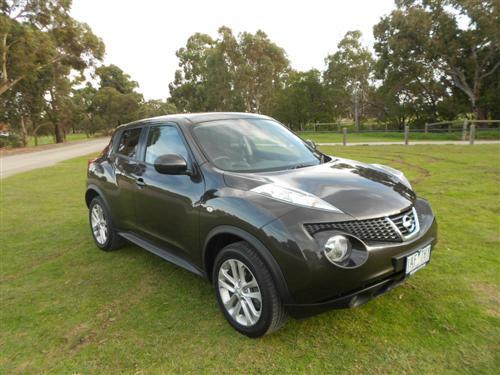 It is my opinion that the Juke is a better presented car than the Nissan Pulsar on both the driveway and the road. This new cross-over model has an unconventional appearance, but the Nissan Juke is quite uncomplicated under its exterior fashion statement. It's all very conventional in the specs department, which should make ownership uncomplicated. ST comes with a Euro4 compliant 1,598cc four-cylinder engine that has 86kW of power at 6,000rpm and the maximum torque is 158Nm at 4,000rpm and front-wheel drive. No diesel power is available. A five-speed manual gearbox comes standard, but the test car had a CVT auto that suits the car. Speed sensitive electric power steering is standard. Turning circle is 10.7 metres - quite a good figure. Seventeen-inch alloy wheels are standard on the ST. 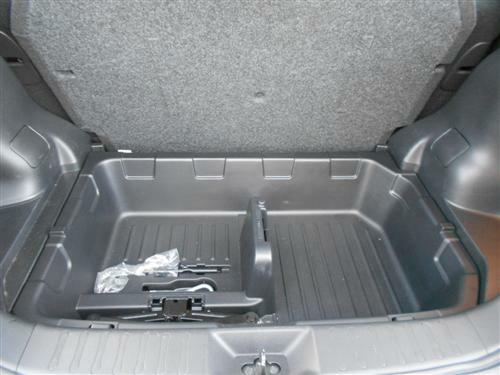 The spare wheel is the 'space-saver' type and it sits beneath a hidden handy storage area below the 'floor' of the boot space. Suspension is by Macpherson struts at the front and Torsion beam at the rear. A fairly routine set-up for a conventional small cross-over vehicle. Factory specs indicate the fuel consumption rating is 6.3 litres per 100 kilometres on the combined cycle for the CVT version (a little less for the manual). Our drive experience of 329 kms around Melbourne's south-east returned a fuel usage figure of 7.1 litres per 100 kilometres according to the car's trip computer. We were happy with that consumption. The fuel tank capacity is 46 litres. Preferred fuel is premium unleaded 95RON fuel. Standard: Single CD player with AM/FM radio, 4 speakers, USB/iPod connectivity, Bluetooth hands free phone system, Bluetooth audio streaming. There is no steering wheel controls for the audio on the Juke ST.
Standard: Six airbags, Vehicle Dynamic Control (VDC), Traction Control System (TCS), Anti-lock Braking System (ABS), Electronic Brakeforce Distribution (EBD), Brake Assist (BA) and more. Nissan Juke 1.6 petrol (non-turbo models) have a five star crash worthiness rating from ANCAP, having scored 33.03 points out of a possible 37. 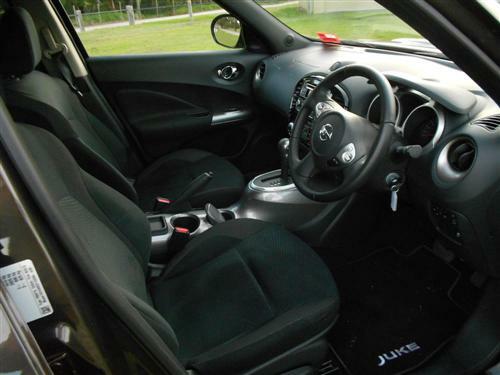 Improved leg protection for front seat occupants could increase the Juke score. Now the Juke isn't really an SUV, it's more like the SUV you're having when you're not having an SUV. That said, the Juke, like some of its cross-over vehicle type competitors, does possess some SUV-like qualities. Nissan Juke can haul a braked trailer (and load) up to 1,250kg. 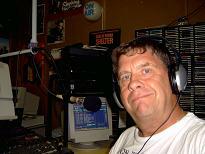 An unbraked trailer up to 600kg is OK. Naturally, appropriate towing equipment is required. 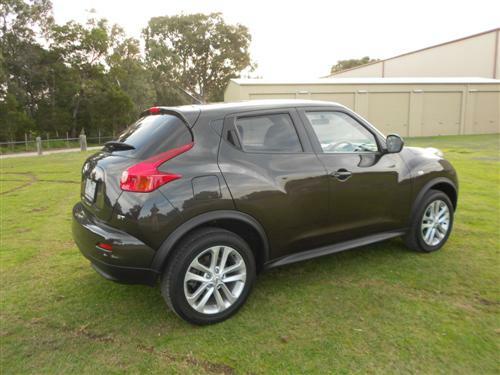 Juke ST requires servicing each 6 months/10,000kms. A 3 year/100,000km warranty and 3 years Roadside Assistance (conditions apply) is included with a new Juke. An Extended Warranty is available (conditions apply). Capped price servicing is available for six years/120,000km (conditions apply). The prices can be supplied prior to purchase. 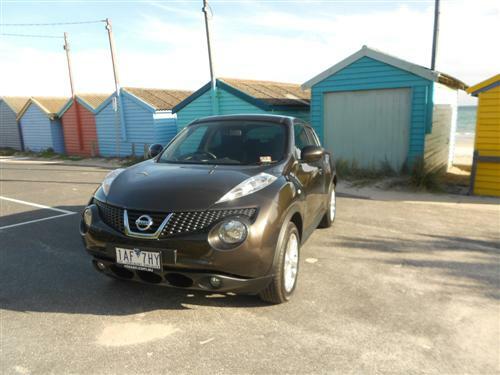 Being an entry level model, the Juke ST misses out on some popular features such as automatic headlights and reversing camera. But this is often the case. The Nissan Juke ST is a mighty fine offering in the small cross-over class. It has stand out styling and a good presentation that is admirably eminent for an entry level model in this market segment. And it has a good feel on the road. 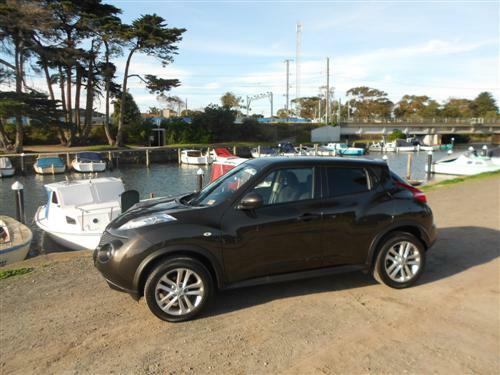 It pleases me that Juke is finally available to Australian buyers because even in entry level guise it's a very pleasant little car.